Space station commander Scott Kelly and Kjell Lindgren carried out a tedious seven-hour 16-minute spacewalk Wednesday, installing cables needed for a new docking mechanism, mounting insulation panels on a physics experiment to improve cooling and lubricating the latching mechanism of the station’s robot arm. But Kelly needed more time than budgeted applying grease to hard-to-see internal components and as such was not able to meet up with Lindgren late in the spacewalk to complete one of the cable installations. After already agreeing to extend the spacewalk by a half hour or so, mission controllers told Kelly to skip a few final lubrication steps and Lindgren was told to forego re-installation of a vent valve on the Tranquility module, a low-priority task that was deferred to a future spacewalk. But the major objectives of U.S. EVA-32 were mostly accomplished and after collecting tools and equipment, the astronauts made their way back to the Quest airlock and called it a day. 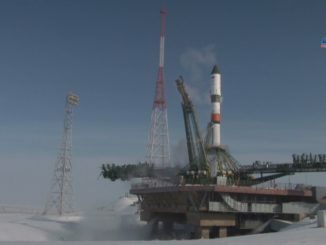 Repressurization began at 3:19 p.m. EDT (GMT-4). Kelly, nearly 215 days into a nearly yearlong mission, and Lindgren plan to venture back outside a week from Friday to reconfigure the ammonia cooling system on one of the station’s sets of solar arrays. Wednesday’s spacewalk, the first for both Kelly and Lindgren, began at 8:03 a.m. when the astronauts switched their spacesuits to battery power. After exiting the airlock and assembling tools and equipment, the two men went their separate ways. Kelly first removed insulation from an electrical distribution box known as a main bus switching unit that is mounted on an external storage platform. The MBSU suffered a fault of some sort earlier and with the insulation out of the way, it can be robotically removed by a future crew and eventually brought inside for troubleshooting and repairs. 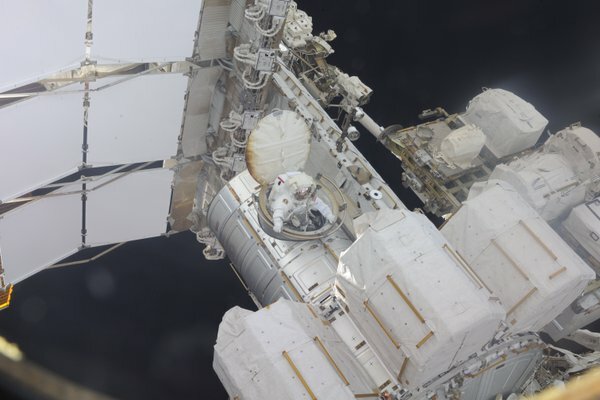 Lindgren, meanwhile, moved to the upper right side of the station’s main power truss and installed insulation on the Alpha Magnetic Spectrometer, a high-profile particle physics experiment that has experienced cooling problems in recent months. The insulation should help improve temperature control. After stowing the insulation bags and associated tools, Lindgren began work to lay cables that will deliver power and data to a new docking mechanism that will be installed on the forward Harmony module’s upper port in 2017. The new International Docking Adapters, one atop Harmony and one on its front end of the module, will be used by new U.S. crew ferry craft being built by Boeing and SpaceX starting in late 2017 or 2018. At one point, Caldwell Dyson, a veteran spacewalker, asked Lindgren to read the label on a cable connector. He did so, although he said the label was hard to read. “It’s pretty faded, so that’s my best guess,” he radioed. “You were probably still in diapers,” she joked. “I’m STILL in diapers!” Lindgren replied, drawing laughter in mission control. While Lindgren focused on routing the long cables, Kelly worked on lubricating internal drive screws and bearings in a so-called “latching end effector,” or LEE, on one end of the station’s robot arm. The arm has a latching mechanism on each end so it can move inch-worm fashion from work site to work site and over the years, telemetry has indicated a slow increase in friction and motor currents. 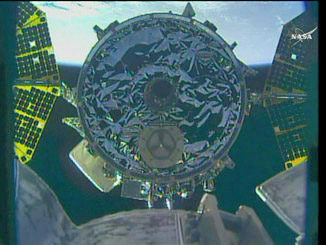 One LEE was lubricated during a spacewalk earlier this year and Kelly took on its counterpart Wednesday. Using a grease gun and a long custom applicator, the station commander had to do most of the lubrication work “in the blind” without being able to see the drive screws in question. 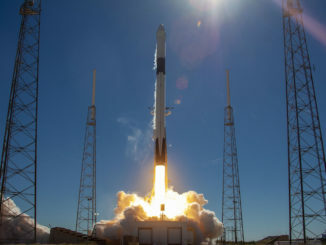 He frequently had to stop and clean up the grease gun and sought guidance from mission control to make sure the applicator was properly aligned. He completed most of the planned work, but with the spacewalk running longer than expected, flight controllers opted to skip a few final steps, telling the astronauts to pack up their tools and equipment and head back to the airlock. This was the 189th spacewalk devoted to station assembly and maintenance since construction began in 1998, the fifth so far this year and the first for Kelly and Lindgren. With today’s EVA, 122 astronauts and cosmonauts representing nine nations have logged 1,184 hours and 16 minutes of EVA time working outside the space station, or 49.3 days.